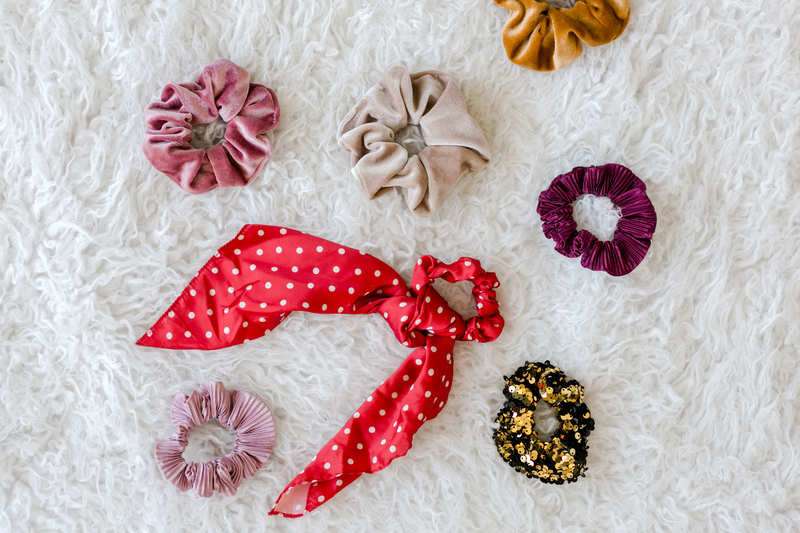 Most likely, at this point, you’ve either already jumped on the scrunchie train or you’ve thought about it but aren’t sure how to style those cute little things besides using one to hold your hair back while you wash your face at night. Don’t worry! 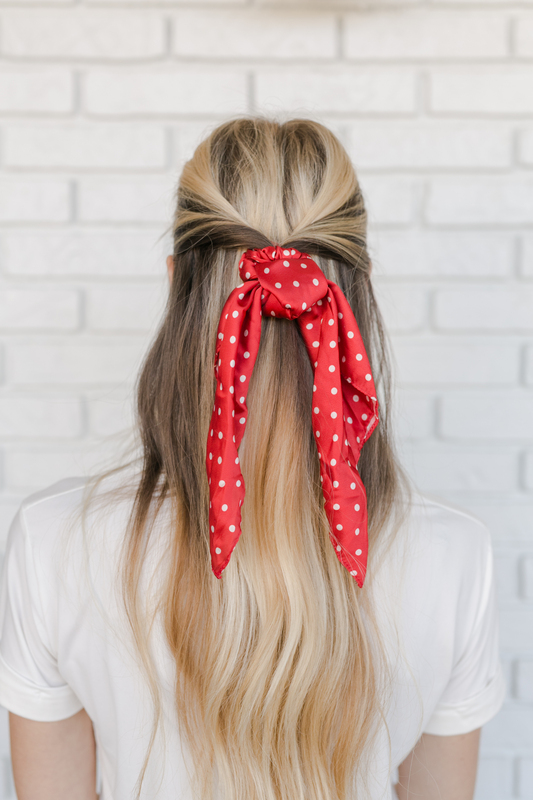 We’ve got five easy ways to style your hair and feature that scrunchie trend that’s been showing up over and over in your Pinterest feed. 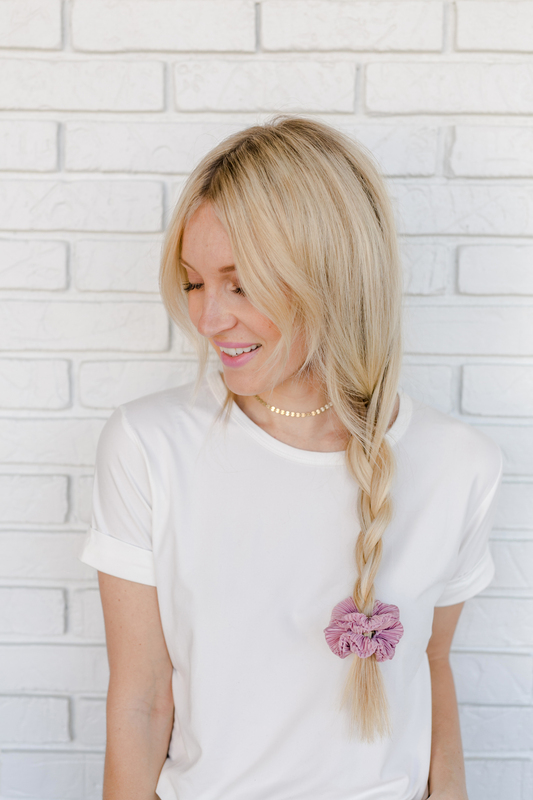 You can even make your own scrunchie if you want to add some DIY elements into the mix! 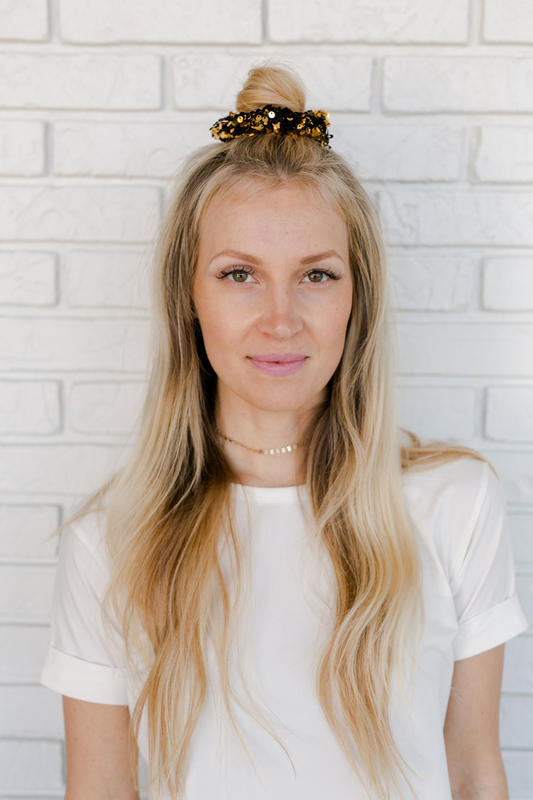 The Messy Bun: Style your hair into a messy bun (use our tutorial to get some extra volume options or watch my tutorial video for a simple bun), leaving some shorter bang pieces out of the bun if you have them. Slide a medium to large scrunchie around the top of the bun to sit at the base. This is a great look to use a bow scrunchie with, as you can style the bow in the back or the front as you prefer. The Braided Look: Such a cute look for longer hair! Gather your hair to one side and do a medium tight braid using a hair tie to secure about 4″ from the bottom of the hair. Slide the hair tie down an inch or so and use your fingers to “pancake” the braid by pulling the sections in opposite directions with your fingers (there’s some photos of that and a link to the plumping powder I like to use for braids in this post) to loosen the braid and make it appear wider. Use a small to medium scrunchie to cover the hair tie. Depending on any bangs or layers you have, you can leave pieces out in the front or pin them back into the hair as needed. 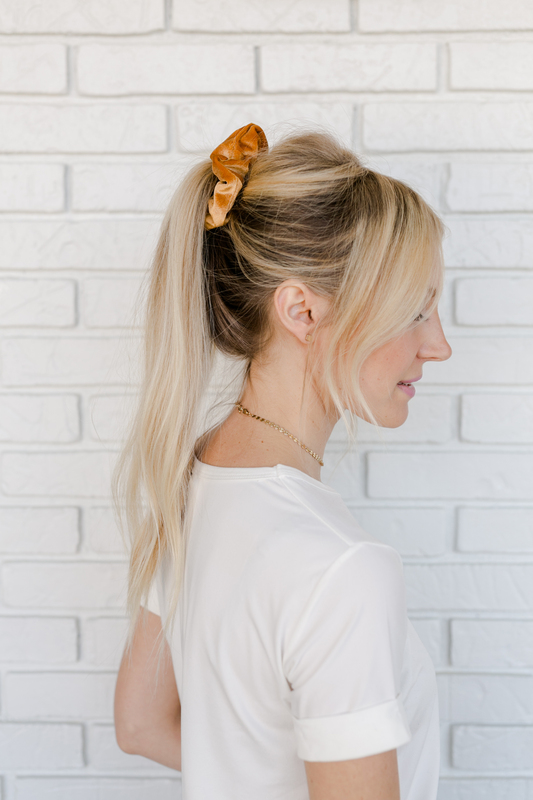 The Messy Ponytail: Gather your hair into a medium-height loose ponytail and secure with a regular hairband. Put your fingers into the top crown of your head and pull parts of your hair looser on top so you create a little volume and pull out some wisps of hair around your face for that messy look and add your medium to large scrunchie around the ponytail (to cover the hairband underneath that’s doing all the support work). This is also a great hairstyle to do after using a texturing spray so you have a little texture to your hair as well. 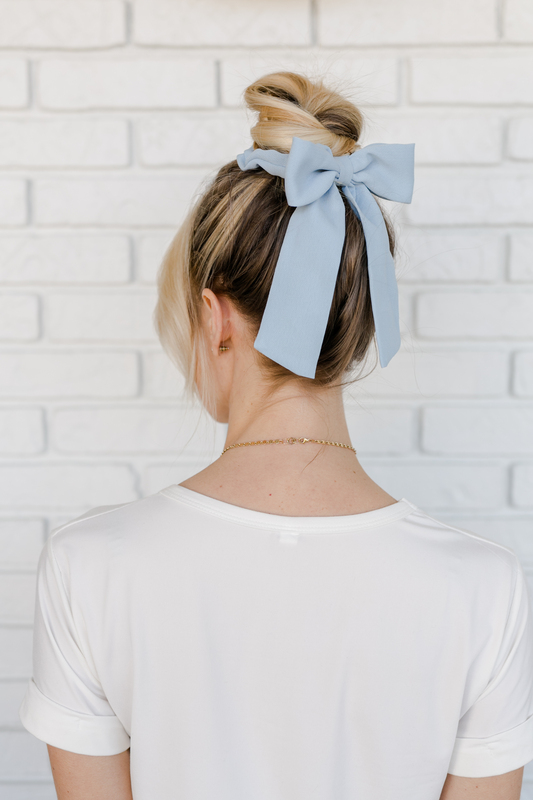 The Topknot: Use our topknot tutorial to create your topknot (you can also add in some hair extensions for extra volume) and slide a small- to medium-sized scrunchie over the knot. The Back Twist: Take the two sections of your hair that fall right above your ears and twist them both towards each other (you can either do a tight twist or a more loose twist, but just try to twist them evenly). Once twisted, secure together at the back of the head with a hairband and then add a scrunch over the top of the hairband. 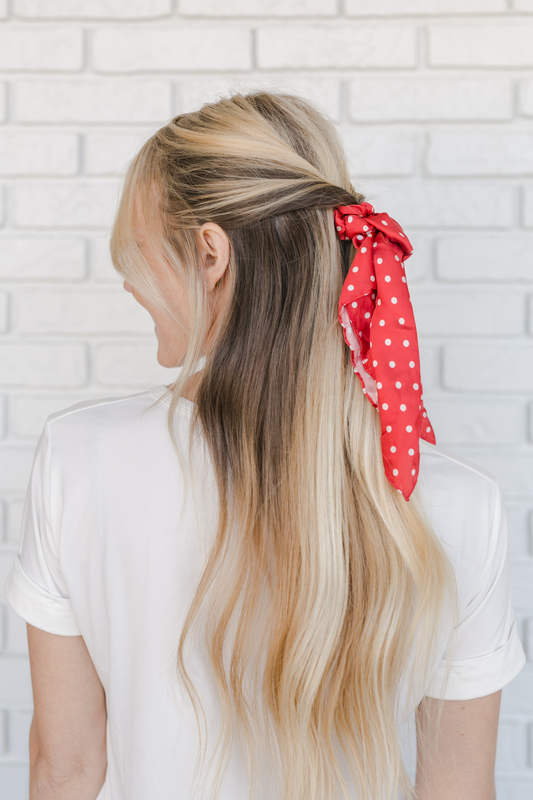 This is another great hairstyle to use a bow or tie scrunchie on since it can trail down the back of your hair. You can also leave out some hair pieces around your face or twist all your hair into the hairstyle—it’s up to you! Credits//Author: Laura Gummerman. Photography: Amber Ulmer. Photos edited with A Color Story Desktop. 7 Gallery Walls For Every Room – And A Fail-Safe Way To Hang Art!